Leandro can’t get enough, but I’ve had enough. My pasta with spinach and garlic — itself a variation on aglio, olio e peperoncino — is really good, a guaranteed winner with the little one, and makes easy leftovers for the lunch boxes, but I am done with eating it once a week. So, I figured I’d mix it up a bit. I had more-or-less the right ingredients for a Sephardic-Mizrahi-inspired spinach dish – the kind of flavors that Mediterranean Jews have combined beautifully for centuries — and which really suit the change to fall. It is also done in a flash. The spinach from Restoration Farm is in season and lovely, while raisins and nuts provide a density and intensity that agrees with the more serious autumnal weather and light. 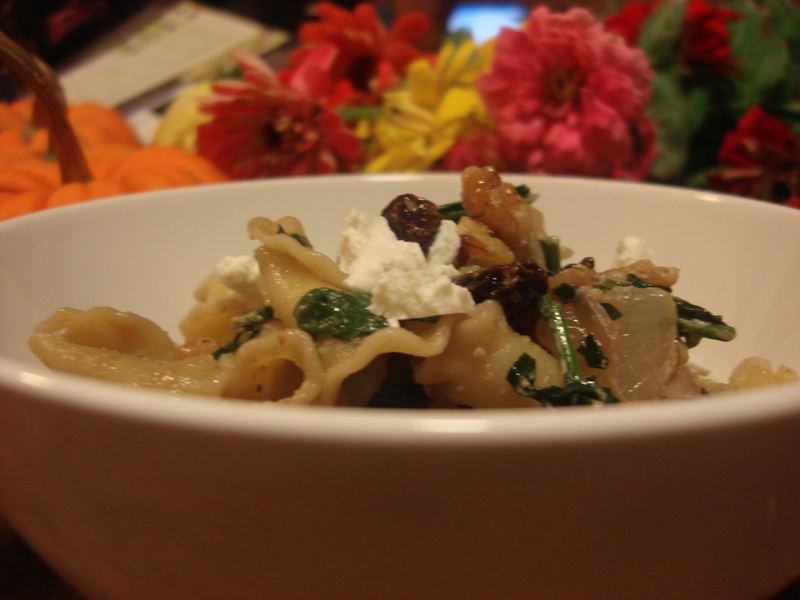 As this dish is inspired rather than traditional (I guess I am Reformed, even though I’m not even Jewish, but we can argue about that later), I ended up using goat cheese because it’s what I had…feta would work just as well and might just be a bit more in keeping with the motif. Also, the Sephardim would use pine nuts, but at upwards of $20 a pound, I will stick to my walnuts (no joke even at less than $10 a lb.) and toast them for more elegance and flavor. I wish I could say that Leandro loved it, but actually he decided — three bites in — that he kind of hated it (Methinks he was surprised — in not a good way — by the raisins) and ended up eating some extra pasta that I had (wisely, because after four years I know how these things can go) reserved. He had it with goat cheese (new for him) and still thinks I am the best cook ever (except for his Padushi), so no harm done. And I loved it. If I had known Leandro was going to bail, I would’ve skipped the pasta in favor of couscous or rice. Live and learn. Prepare pasta according to package directions. Drain and reserve ¼ cup cooking liquid. Meanwhile, heat olive oil in a medium-hot skillet and add onions. Stir to coat, lower heat and sauté until tender (about five minutes) toss in spinach. Stir to coat and cook until just wilting. Add raisins, walnuts, nutmeg, and salt and pepper to taste. If it seems too dry, add reserved cooking liquid by the tablespoon until you like the look of it. Pour over pasta and mix and top with desired cheese. 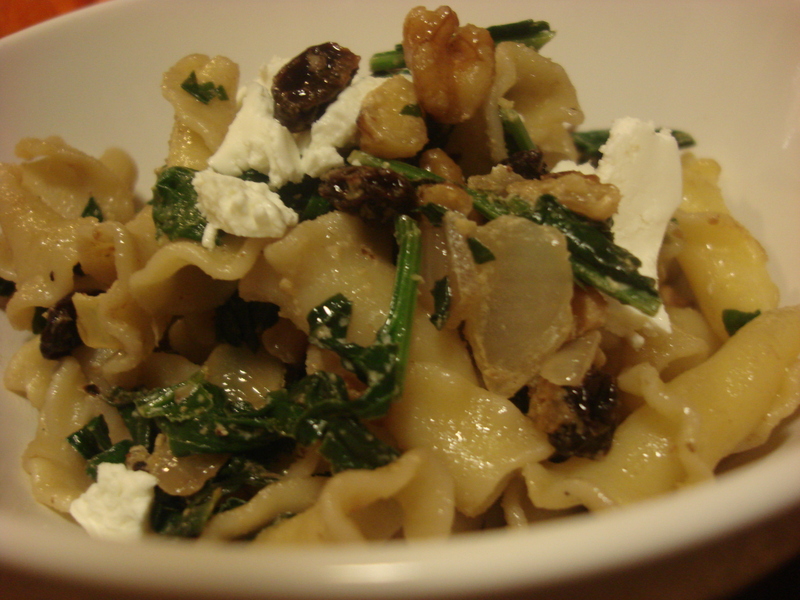 I’m not a raisin fan, but I love feta and spinach and pasta. This looks so warming. Hopefully Leandro will come around – the pasta looks delicious!